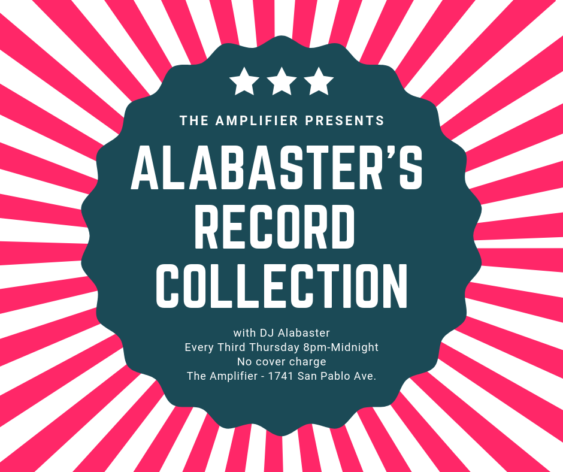 Join DJ Alabaster on Thursday, April 18, from 8pm-midnight at The Amplifier for Alabaster’s Record Collection – All Out ’70s Edition! Hear your favorite rock and new wave throwbacks on vinyl while sipping some carefully crafted themed cocktails in Oakland’s hottest new bar! No cover charge! DJ Alabaster will join us every third Thursday! Enjoy fantastic and FREE DJs every Thursday, Friday, and Saturday night from a rotating roster of local talent in a beautifully refurbished Uptown bar! Spacious seating, ample parking, and friendly staff help make The Amplifier the perfect home for your favorite Oakland DJs! Enjoy music while sipping a delicious locally-brewed beer from The Amplifier’s ample selection or fantastic craft cocktail like the Raspberry Beret or Proud Mary! Make an evening of it and visit one of the nearby award-winning restaurants as well! The Amplifier is the latest and hottest addition to Oakland’s thriving nightlife scene! Check out our amazing sound system, collection of local concert posters and amplifiers, take a spin in our photo booth, and of course enjoy some tasty beverages while you’re at it!